61cm x 92 cm of 24" x 36", Trellis Window Film, An Inexpensive Alternative To Stained Glass or Textured Glass, Translucent But Not Transparent, Allows Light To Enter The Room, Provides Privacy, No Adhesive Necessary, Will Tile Together Like Wallpaper, Top To Bottom, Left To Right, Can Be Easily Removed With No Adhesive Residue After Years Of Installation, Easily Trimmed To Fit, Self Static Adhering, No Adhesives. Brush strokes privacy film is like an abstract watercolour painting for your glass, evoking the gentle beauty of Monet's water lilies. This premium privacy window film blocks unwanted views and filters light while providing an artful update for any glass surface with a prismatic finish. This heavy-weight vinyl window film measures 24in x 47in and is totally removable and reusable. With a prismatic geometric design, the cubix window film creates a high style look on any glass surface. This premium quality, heavy weight privacy film is deeply embossed and has a captivating opalescent finish. Create privacy and enjoy naturally refracted light through this fine window film. Cubix privacy film measures 24in x 47in and is totally removable and reusable. 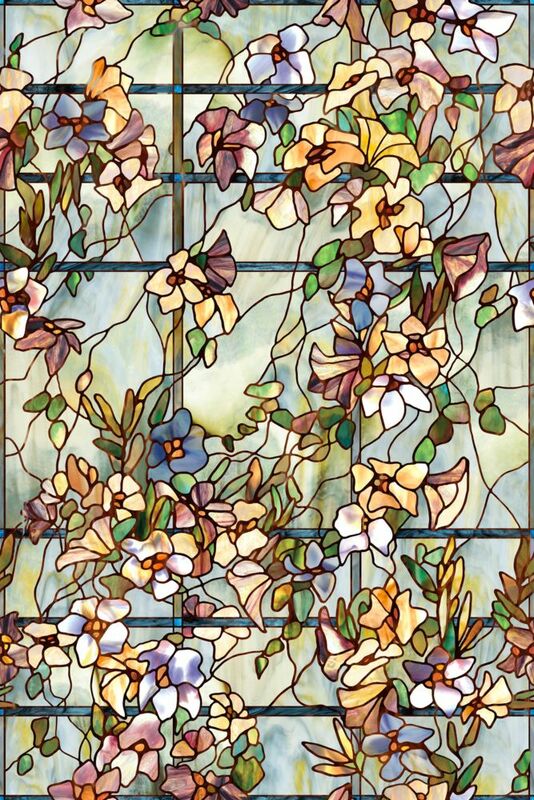 This premium design window film brings an elegant floral print to your glass. With a heavy-weight embossed material and a prismatic effect, this vinyl cling creates privacy and filters light while adding a beautiful detail. Our privacy window film measures 24in x 47in and is totally removable and reusable. 24 Inchx36 Inch WF - Trellis 61cm x 92 cm of 24" x 36", Trellis Window Film, An Inexpensive Alternative To Stained Glass or Textured Glass, Translucent But Not Transparent, Allows Light To Enter The Room, Provides Privacy, No Adhesive Necessary, Will Tile Together Like Wallpaper, Top To Bottom, Left To Right, Can Be Easily Removed With No Adhesive Residue After Years Of Installation, Easily Trimmed To Fit, Self Static Adhering, No Adhesives. 24 Inchx36 Inch WF - Trellis is rated 4.6 out of 5 by 99. Rated 5 out of 5 by Toga from It looks beautiful!... It looks beautiful! Rated 5 out of 5 by Niece from This window art looks extremely nice on my tall, foot... This window art looks extremely nice on my tall, foot width windows. Thank you so much! Rated 5 out of 5 by DIYlady from This home project turned out great. The window cling... This home project turned out great. The window cling was easy to work with and it turned out great, very pleased with this product, I highly recommend it! Happy cling user! Rated 5 out of 5 by CaveLady from Great quality window film, little smaller than I thought because... Great quality window film, little smaller than I thought because I bought 2 for my 45" x 45" window but later I had to buy one more. I cannot say how it would work without glue but I used spray glue and it worked extremely nicely. My bathroom window is looking very nice inside and when I turn on the light it looks amazing from outside. I am very glad with my purchase and highly recommend for low budget renovations, it makes huge impact with very low spending.